In this course, the kids will learn how to program the basic robot movements (forward/backward/turning) and use some sensors to find a line and detect when hit something. The focus is on implementing their ideas, troubleshooting any problems, and then making improvements. The kids should be coming up with their own ideas for completing the task. In other words, besides the building the initial robot, there are purposefully not a lot of examples. • Program the robots sensors “detecting collision” using the touch sensor and navigate a course. • Using the light sensor write a line follower program then navigate a course. 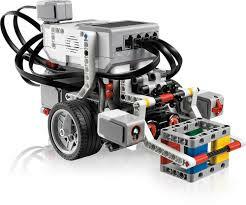 • Build robots in different configurations performing tasks on a simulated course.